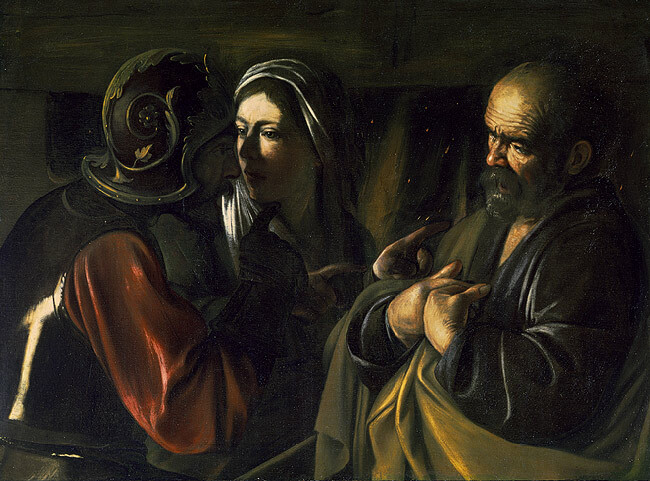 THE BLOG Emotional Insight in Caravaggio's "The Denial of St. Peter"
Regular readers of this site know that I try to find big, easy-to-get with examples of emotional insight. Emotional insight is what a work of art communicates: insights into the meaning of things that your heart — your heart alone — sees. Today we’re going to be looking at a painting by Caravaggio. Look how Peter seems to be shrinking, becoming more wizened, pathetic and miserable as he denies Jesus. And look at his hands, pointing inward to his heart. Do you feel that? That is exactly the thing that can’t be communicated in any intellectual words, but which is communicated so powerfully by this painting.